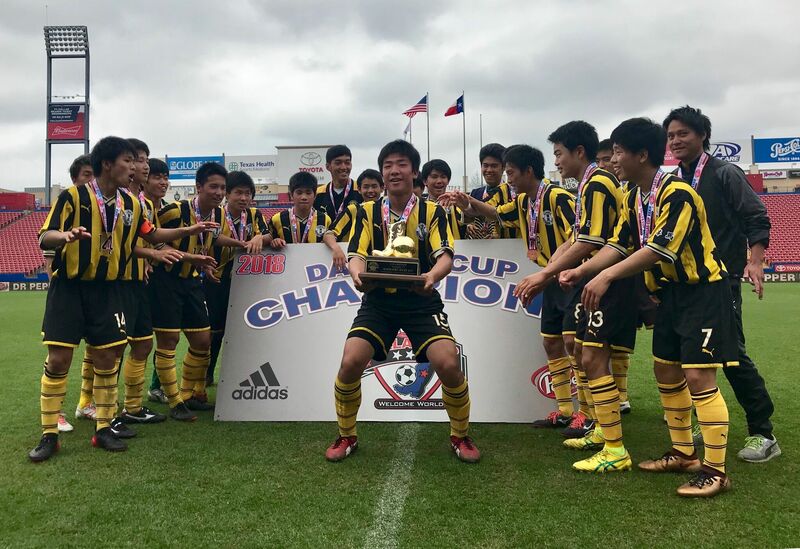 Tigres Wins Gordon Jago Super Group Championship | Dallas Cup, Inc.
DALLAS, Texas (Sunday, Apr. 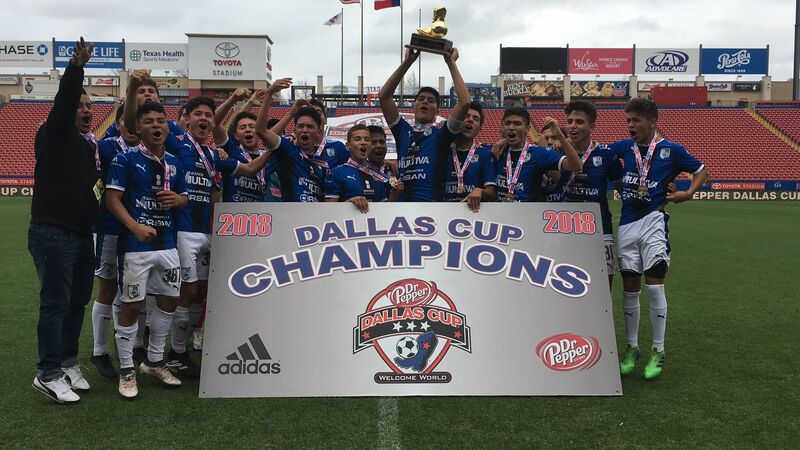 1) – The Dr Pepper Dallas Cup, the oldest and most prestigious international youth soccer tournament in the United States, concluded today at Toyota Stadium in Frisco. 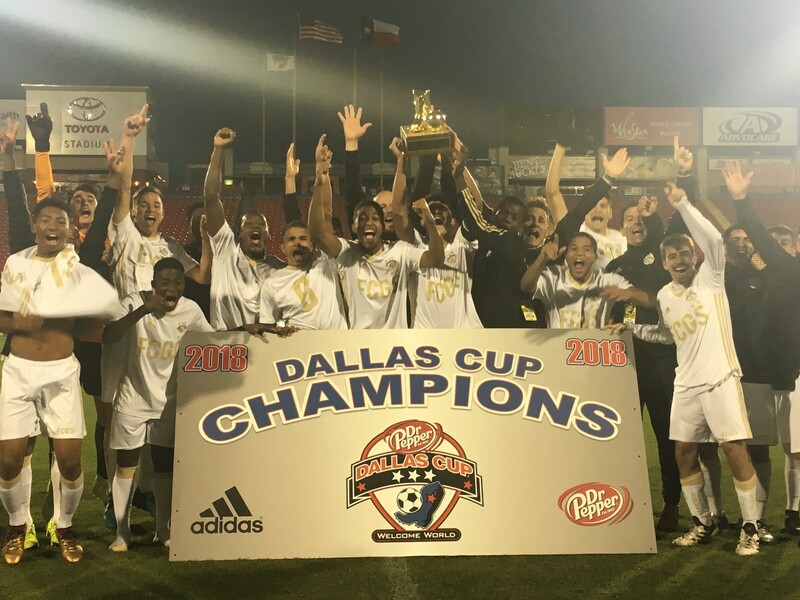 The champions of the Under 16, Under 17, Under 18, Under 19, and Gordon Jago Super Group divisions were determined, capping off the 2018 Dr Pepper Dallas Cup. Championship Sunday was highlighted by the Gordon Jago Super Group final between the Premier League’s Arsenal FC and Liga MX side Tigres. The match was broadcast live from Toyota Stadium at 3pm on Univision Deportes Network, the No. 1 Spanish-language cable sports channel in the nation. On a crisp North Texas afternoon, Tigres scored the opening goal of the match in the 25th minute. Jesus Garza received a well-played ball in the box and confidently tucked it away just inside the far-post. The goal was Jesus Garza’s third in as many games. Arsenal, coming off their thrilling semi-final win over Manchester United on Friday night, struggled to create many threatening opportunities in the first half, as the halftime whistle blew with Tigres ahead 1-0. From the start of the second half, Tigres continued to look like the better side. The two-time Super Group champion controlled most of the possession and kept the speedy Gunner’s attack in check. In the dying embers of the match, the English side began to threaten the back line of Tigres, but they were unable to find the equalizing goal in the end. The match finished with a score of 1-0 as Tigres hoisted the iconic Super Group “Boot and Ball” championship trophy for the third time (2003, 2011). The Under 16 Dallas Cup champion was decided this morning between north Texas side Solar SC and Mexico’s Queretaro FC. Before today’s match, the Mexican side had yet to allow a goal in their five matches played. That changed in the 10th minute, as Solar’s Grant McCarty delivered a strong header in the box that flew into the back of the net. Los Gallos Blancos would answer back in the 22nd minute, when Iker Ortega positioned himself in the box and blasted a shot past the Solar keeper to level the game at 1-1. The match offered back and forth action in both team’s halves, but neither side was able to connect on a go-ahead goal in regulation, as the match went into extra time. The match remained deadlocked at 1-1 after two extra-time periods, sending the match to penalty kicks. Queretaro connected on all of their attempts, crowning the Mexican side the Under 16 champions of Dr Pepper Dallas Cup XXXIX. The Under 17 Final between Japan’s Maebashi Ikuei and Mexico’s Necaxa kicked off at 10am at Toyota Stadium. Scoring opportunities for both teams were hard to come by early on, as the match went into the break tied 0-0. The game remained scoreless until the 65th minute when Hiro Satoh opened up the scoring for the Japanese side. From that point forward, Maebashi looked like a different side, as they started a storm of attacks in the Necaxa half. Satsuki Mori (72’), Shuto Kamiya (75’), and Masato Shibata (77’) scored a trio of goals within five minutes. Mori’s goal was especially noteworthy as he delivered a stunning strike from outside the penalty area. Maebashi Ikuei did not look back, carrying the 4-0 score line through the final whistle, and winning the country of Japan a “Boot and Ball” championship trophy for the second consecutive year. The third match of the day was a California showdown between Orange County SC and Santa Clara Sporting to decide the champion of the Under 18 age division. The first half saw open play for both teams, but neither team was able to crack the scoreboard. In the second half, Santa Clara Sporting started to show their class. In the 46th minute, Santa Clara Sporting’s Rodolfo Pedroza-Arevalos scored the opening goal of the match with a brilliant strike. In the 71st minute, Javier De Los Santos Jr. gave Sporting a two-goal cushion after slotting the ball past the onrushing Orange County keeper. Minutes later, Joshua Robertson added a third goal on a skillful run, making the score 3-0. 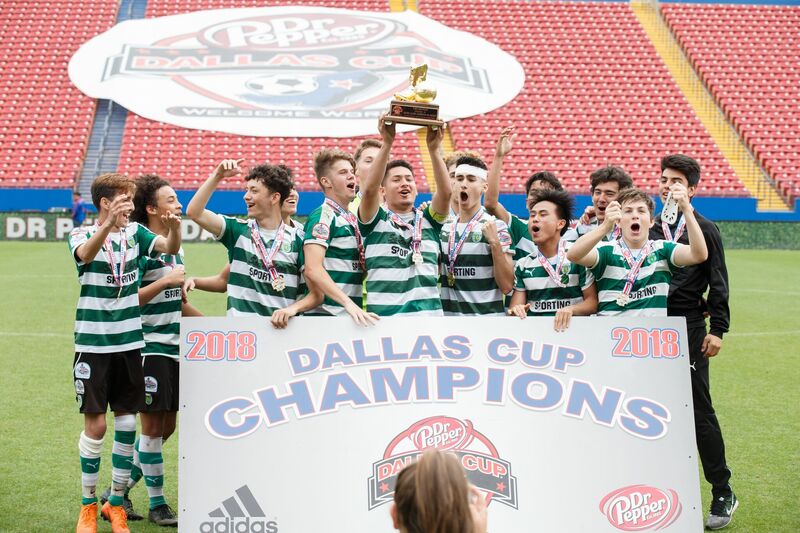 Santa Clara Sporting continued to play strong defense, maintaining a clean sheet, on their way to claiming the Under 18 Dallas Cup championship. Dr Pepper Dallas Cup XXXIX wrapped up with a coast-to-coast battle between California’s FC Golden State and New Jersey’s Cedar Stars Academy for the Under 19 Championship. The score did not stay locked for long as an early corner-kick in the 3rd minute found Matheus Batista who put FC Golden State ahead 1-0. In the 14th minute, FC Golden State committed an own goal after some miscommunication in their own penalty area making the game level at 1-1. In the 48th minute, FC Golden State’s Thiago Ribeiro was sent off following his second yellow card, leaving the Californian side fighting with 10 men. Despite the man-disadvantage, FC Golden State was able to carry the game into extra-time with the match still tied 1-1. After two scoreless extra-time periods, a penalty kick shootout was needed to determine a champion. FC Golden State was more clinical from the spot, winning the shootout, and claiming the Under 19 Dallas Cup championship.